This is a guest post from Mariah Coz from COMET Camper. I’m Mariah Coz, and I live in a 100 square foot vintage trailer that I renovated and re-designed. I teach the Tiny Transition and Downsizing E-Course, which is now open for enrollment for the session about to begin on October 5th. I wanted to share some of the things I’ve learned from my experience designing and living in such small spaces! Whether you live in 10 sq. ft. or 1500 sq. ft., I think it’s a great idea to incorporate “tiny” design features to create more room and less clutter in your space. My tiny home on wheels, the COMET camper, has some pretty nifty features you might never notice if I didn’t point them out! Everyone who visits my tiny home is surprised at how much function I have in such a small area. I want to show you how I do that. 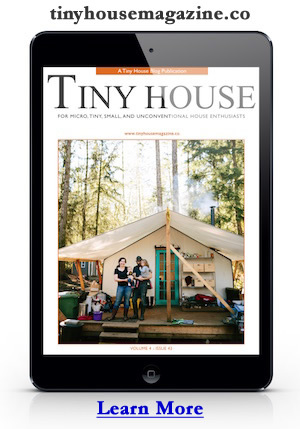 Today I have 5 tiny house design tips that you can implement no matter where you live! 1. Create a vermi-compost or “Worm-bin” system under a bench for indoor, odorless composting! Most people living in tiny homes don’t “own” the land they live and park on, and so are limited in their composting options. And if you live in the city or in an urban area, you might not have your own yard to create a big, open compost pile. But that’s what worms are for! In the COMET, I have a vermiculture (composting with worms) set-up underneath the front dinette bench near the door. The worms are red wigglers (I got mine on Amazon) and they are tiny BEASTS let me tell you. They eat ALL of my food scraps, including eggs shells and coffee grounds. The worms live in a “rubbermaid” type bin, you just throw your green and brown scraps in, and they make short work of it. This system is tiny and odorless, perfect for apartments and tiny houses or mobile campers and RVs. I love my little fold-down desk. I made it out of an old hunk of plywood and some vintage Formica tabletop that I salvaged from a table that was mostly damaged but had this one good piece that was stuff re-usable. The fold down desk was really simple to make, just a few hinges and a slide lock to hold it up and out of the way. It’s nice to have the space in the back of the trailer so convertible – it’s a couch/relaxing area, a work area during the day, and when I fold the desk up it becomes my bed area at night. It’s only big enough to fit my laptop, but that’s all I need in a desk at the moment! My kitchen counter is about 2 sq. ft. total, when you take out the space for the sink and cooktop (that’s why I added a fold-up counter extension for when I need it!). In order to keep the counter clear, I use all of the vertical space around the kitchen area for storing kitchen items such as spatulas, soap, sponges, and more. I got a few small things from ikea that help me keep everything organized in the tiny kitchen. I recommend getting lots of hooks and small shelves, and getting as much stuff OFF of horizontal spaces as possible. It makes the whole place feel much bigger, and there’s no clutter on the tables, counters, etc. 4. Your spaces should serve multiple purposes. “Multi-function” or “stacking functions” is a term I use a lot in reference to permaculture, but it applies so perfectly to small space design. I have a few examples of this in action in the COMET camper. The back area, which is my couch and convertible workspace/desk area during the day, is also my bed at night when it folds down. That same area of maybe 15 sq. ft. total is my living room, home office, and bedroom. And in the front of the camper, the dinette (kitchen table) doubles as a “guest” bed when folded down. Technically my camper could sleep 6 people, but we’ve never tried that! 5. The less crap you have, the easier it is to design your space. This is where the downsizing comes in. The honest truth is that it’s much easier to design your living space when you have less crap, and hold onto just a few things that you totally love. Giving your beloved items the space they need to shine is what this whole tiny house thing is all about! You don’t need to be a complete minimalist either, I’m certainly not. I love tchotchke’s and weird knick knacks, so I have a small shelf devoted to those things. Once you downsize your stuff, you’ll see how everything falls into place around it in your tiny house. If you need help, support, and the motivation to start downsizing in preparation for a smaller life, the Tiny Transition and Downsizing E-Course can kick-start you into gear. When you join the class, you get 8 weeks of downsizing bootcamp (lessons, tasks, challenges, reading and writing prompts) and lifetime access to the private class-only forum, so you can meet and connect with others on the same journey as you. The class will not only get your house, mind, and life decluttered and cleared out, but it will help you change your relationship with stuff. If you feel like your stuff owns you instead of the other way around, I hope you’ll join us in the next session of Tiny Transition + Downsizing, which begins on October 5th 2014. You can find out more and register here. This entry was posted in How To and tagged comet camper, downsizing, E-Course, Fold-Down desks, fold-up counter, Mariah Coz, vermi-compost, vintage trailer. It looks like a compact and rigid house. I want to de-clutter my “hoarded” trailer and downsize so bad. Want the simple life!….who needs stuff??? Cool! I can live with that house for life. as long as i have internet. Lol. But yeah its very practical. Its comfortable and cozy. Glad I came across your post. My family will soon be transferring to a much smaller house. I agree that the less crap you have, the easier it is to design your space. I will definitely take note of this. Thanks.